Welcome to the acuteFX News page. Here you can find all of our posts regarding special offers, website updates and newly completed projects. 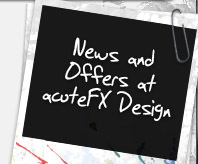 If you would like to keep up to date with the happenings here at acuteFX Design please subscribe to our newsletter. Computer Repair Shop opened in Loughborough! It's been a busy couple of weeks, but the STORMComponents PC repair shop is now open! Thanks to everyone for their support while the new office and workshop were in development! The move is almost here! acuteFX Design is looking to move into our new office within the next 7-14 days! The STORMComponents shop is only days from being finished now, with some final decals and graphics to go up and the computer systems to be installed this week. Make sure to look out for us on Derby Road! You can see some up to date pictures on our Google+ or Facebook accounts. acuteFX Design is pleased to announce the release of Spice Fusion's brand new website! We've been working closely with Loughborough's newest Restaurant over the last couple of weeks to produce their logo and website in record time, coinciding with their grand opening. The website utilises a dynamic layout, gallery and offers page all controlled via the custom-made content management system. We've also built a simple mobile site for Spice Fusion to allow customers on the go to quickly get in touch or check opening times. Feeling hungry? Check them out. I've taken a little while today to add some more past work to our portfolio, so make sure to check them out! Several of these projects are from last year that slipped through the portfolio updates, but a few are from recent weeks. As for the office development - we are slowly getting there! Our Planning Permission is in it's final stages now, allowing us to update the shop front to a repaired, high quality finish. The shop's floor is down and the walls are up and painted. Our counter and desks are on their way, and although I don't want to put a firm date on it, we're looking to start trading from Derby Road come next month. Make sure to follow us on our social network profiles for regular updates and pictures. Our profile links can be found at the bottom of the page. acuteFX Design is now 4 weeks into it's grand business development; turning an old retired Loughborough bike shop into a state of the art PC Repair centre, office and home. The garbage left behind has been removed, the floors and walls have been stripped and we're now in the process of getting the floor down and the ceiling back up! Hopefully it won't be too long now until STORMComponents can open to the public, but there's plenty of work yet to go! Pictures of the development will appear on our Google Plus, Facebook and Twitter accounts from time to time, so remember to follow us and stay informed! We finally have the keys to our new Loughborough office! There's a great deal of work yet to do to turn an old Loughborough bike shop into a computer repair and web development office, but we do at least finally have the keys after months of waiting. Over the next month or two we'll be completely transforming what was Beacon Cycles, into STORMComponents - a PC repair, upgrades and advice shop, along with the first commercial office for acuteFX Design. To all our clients, friends and family, we wish you a Merry Christmas and a happy New Year! 2012 has been a good year for acuteFX Design, with almost 20% increase in business compared to last year. We've had great success with websites such as the Cartwright King, and have created more logos and print material than ever before. We also released our updated website, along with a few smaller 'sister' websites such as Photo Restoration Leicester. Our big news though, is that we have secured our first office! Along side our design and development services, we'll be offering computer repair, custom computer builds and maintenance services in Loughborough, under the trading name STORMComponents. Look out for us in the new year! There's been plenty of talk about today's date being the last repetative date we'll see for 100 years, so acuteFX Design is offering 12% off any web development project brought to us today. Two months ago acuteFX Design released the brand new Cartwright King website. We're happy to share that within a few weeks, their daily traffic increased by 25% and their page views doubled. Careful planning on both Cartwright King's and acuteFX Design's part has gained them over 750 potential customers each month. Would you like to do the same? Contact us! MidlandsINDEX on the up and up! I'm pleased to say that MidlandsINDEX has now got 300 registered businesses! If you're unfamiliar with MidlandsINDEX.co.uk, it's acuteFX Design's business directory for the Midlands, UK. If you run a business in the Midlands why not register your company and get your own profile for free? Keeping up to date is important! It's been a couple of weeks since the launch of the new acuteFX Design website and everything's gone smoothly - hurrah! A big thanks goes out to those that have shared it with their family and friends - it's all much appreciated! The site has now moved from 29th to 5th (first page) in Google's search results for "web design loughborough", which just goes to show you how important an up-to-date website and new content is to SEO. If you feel your site is need of a spuce-up, why not get in touch today! Welcome to acuteFX Design V2! It's been a long time coming; and the second version of our website is finally here! Our old website (which you may or may not be familiar with) was the first commercial website built by acuteFX Design Ltd and was coming up to 4 years old this winter, so this upgrade was more than called-for. Step aside out-dated content and tiny text; acuteFX V2 is upon us. Since the first website was built, I've [Tom Allen, Director] become fluent in dynamic website development and this hopefully comes across in the interactivity on this website. The new website holds a more interactive portfolio section so be sure to check that out as well as the new information and work examples displayed across the website. © 2008-2019 acuteFX Design Ltd. Company No. 06585047.